Rowing machines allow you to experience the sensation of rowing without having to step into a boat or go near water. Rowing is considered a form of exercise that demands power as well as muscular and cardiovascular endurance. It is a sport that works your entire body, making it a popular exercise since it works your body in several different ways at once. The amount of calories you burn during exercise depends on a number of factors, so it can be difficult to gauge the exact amount. The amount of calories you burn will depend on the speed with which you row, the level of resistance the machine is set for and the length of time for which you row. According to research data printed in Medicine and Science in Sports and Exercise, the journal of the American College of Sports Medicine, a man weighing 155 lbs. 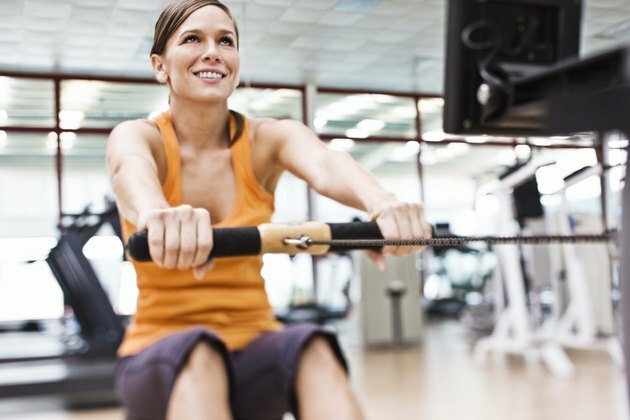 rowing for an hour at a moderate intensity will burn 493 calories. The same man rowing for an hour at a light intensity would only burn 246 calories, while at a vigorous level he would burn 844. The amount of calories you burn also depends on your body. For example, a trained rower who weighs 155 lbs. rowing at a specific speed would burn less calories during a period of time than an untrained, unfit man of the same weight rowing at the same speed, as he would be less efficient and would therefore burn more energy attempting to produce the same level of performance. Also a man with more muscle would consume more energy: a 205 lbs. man rowing vigorously for an hour would need 1117 calories to fuel himself as opposed to a man of 130 lbs, who would burn only 708. If you only row for a short burst of time, say 5 minutes, you will generally lose less calories than you will if you row for an hour although this varies depending on the intensity. It is difficult to keep rowing at maximum effort for 5 minutes, let alone an hour, so you may be better off rowing at a steady pace for a long period rather than exhausting yourself quickly. Using interval training, you can row at maximum intensity for short periods before slowing your pace, then going hard again. This allows you to keep a higher overall intensity over a period of time and has been shown to increase metabolism and calorie burn. Even after you finish training you will continue to burn calories. This is an effect that conditioning expert John Berardi refers to as afterburn. After your workout, your body needs to repair microtears in your muscles as well as refueling the energy stores in your cells. Your metabolic rate will still be elevated, especially if you have been working hard or doing interval training, so your body will still be burning an increased number of calories. This can be as many as 100 to 200 calories more.